← QR codes – on the way up or DOA? The cost of books and supplies is a significant component of the cost of going back to school. It’s not exactly a hidden cost, but it can definitely pack an unexpected wallop on your bank account. I think the most I have spent for books in a semester is $800. That’s higher than the average — CollegeData.com pegs the average per semester in 2012 at about $600 — but you can definitely expect some sticker shock when you head to the bookstore. But textbook shopping does not have to be a nightmare. School is supposed to be *fun* as well as challenging, remember? In that spirit, here are some hints I have discovered that can lessen the blow of inflated textbook prices. Shop early, and shop used! We all know that used textbooks cost less, but your bookstore may only have a limited supply in stock. If you wait to shop until after classes have started, you have probably waited too long. I usually visit the bookstore at least a week before the beginning of the semester. Not only can you then grab the used copies, but you also avoid crowded aisles and long lines. Win/win! Especially if this is your first semester back, you might use the trip to school to look around for your classrooms and get acquainted with campus before your first day, as well. Use an earlier edition or a different version. Often, instructors will permit you to use an earlier edition of a text. I’ve heard many instructors say that publishers simply shuffle some chapters around and change some text and call it a new edition — and charge a higher price. I may be generalizing there, but … that’s what I have heard. If you’re reading literature for any of your classes, you might visit other used bookstores or try Dover Publications. They offer very inexpensive copies of classics. An innovation in the textbook market is the option to rent. Sure, you won’t get an infusion of cash from selling them back at the end of the semester, but the cost of renting can be lower than the net cost of buying. And it’s usually a good idea to keep that money in your pocket for use on living expenses throughout the semester. I’m doing this for the first time this semester, myself. 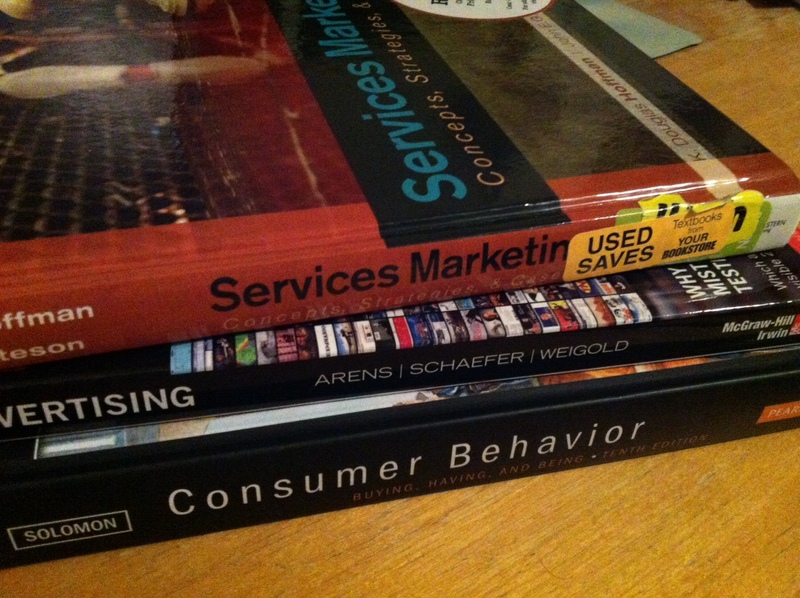 My services marketing textbook costs $324 new or $243 used, but only requires $137.70 to rent. The choice was clear for me. Buy online using a textbook search aggregator. Use sites like bigwords.com to find your required texts at the lowest possible price. It’s common knowledge that brick-and-mortar textbook store prices are higher than prices online. You must be cautious here, though, because many times the cheapest versions may be international versions that differ from the version your instructor requires. Take advantage of e-reader versions of texts. Electronic and digital — even online — versions of texts are less expensive. I find I learn best from an old-fashioned paper book, so I haven’t ventured into the world of e-books myself, yet. But I know that a lot of people really value this option. Check to see if you *really* need a personal copy of the book. You didn’t hear it from me, but many times, instructors will teach directly from the text, so you can simply take notes in class and still excel as far as course requirements are concerned. Similarly, some instructors will “require” a text but not mention it at all throughout the semester — or will do so rarely. In cases like this, you may be able to benefit from a reserved copy of the text in your school library. Check with former students or the instructor to ascertain whether or not the book is actually required. Remember that you may have to buy access to online homework and testing suites. This one really surprised me when I first started back to school and took online classes. There may not be required texts for a class, but you may not be off the hook as far as paying into the education materials market. The upside of this is that you can often complete homework and tests on your own schedule! If you like to have a copy of textbooks for reference later on — and this often recommended, especially with subjects like accounting, mathematics or economics — and that is preventing you from renting, remember that you can quite often find a bargain copy of an old edition on eBay or even in a sale at your school bookstore. There is also the option to convert to a purchase instead of rental at the end of semester if you find the book is absolutely vital. The price of textbooks doesn’t have to keep you from going back to school. With a little planning and legwork, you can easily save hundreds of dollars each semester. It can be a fun project, really! If comparison shopping is not your style, you could always enlist a friend who enjoys the challenge to help you find the cheapest copies. Don’t forget to treat your friend with some of the cash you save! What about you? Do you have any tips or insight into the textbook market? Please share in the comments! And have a fantastic semester! Browse here for rental ,old textbooks on a very big discount price.Free for instructors and up to 60% off for students. Indeed! Searching for and buying used textbooks online is the way to go. Thanks for taking time to read and comment here! If you have already registered for your classes, Dwayne Alicie gives really great tips on how to save money when purchasing textbooks.